Artist Derik Van Beers part of the Roscoe Ceramic Gallery in Oakland, CA stopped by again to show off a video that he was featured in as well as a couple of new pieces that he recently created. 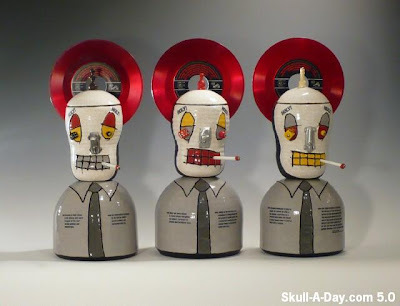 He is also featured in the Ceramics Annual of America exhibit happening in San Francisco, CA October 6-9, 2011. This is amazing work. It is not often we get videos of artists working or of them speaking about their work. Congratulations on the honor of being featured at this year’s Ceramics Annual Exhibit. Thank you for sharing with us again and continuing to be an active member of our community. For my last flashback of this year I'm going out in style and with the bling. Goldsmith Michael Robinson of Auckland, New Zealand created this mastery of jewelry that was featured back in 2009. 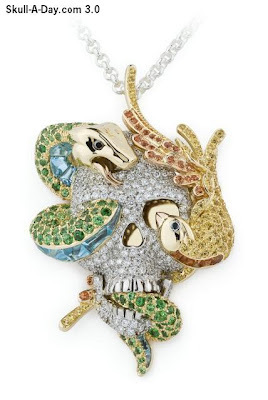 The multitude of gems and the overall design are over the top for most skull jewelry and thus makes me think of a new term "sking"(skull bling). Whatever you call it it's freakin' fabulous and I thank Michael for his submission again. Do you know anyone with some sweet "sking"? 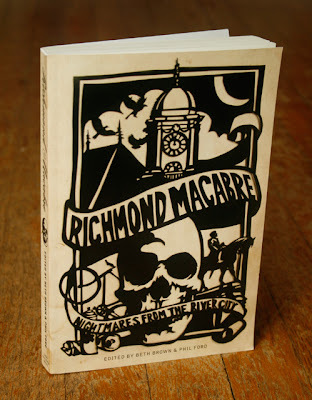 I created this paper cut illustration for the brand new book Richmond Macabre. The book is a collection of short horror stories based in my hometown of Richmond, VA, written by local writers. 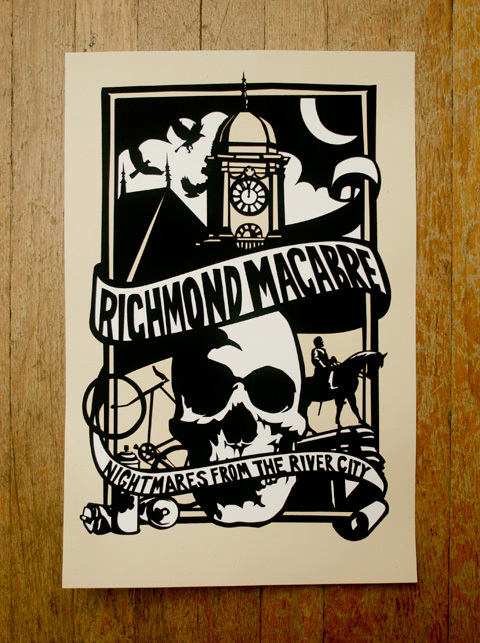 I was delighted to be asked to create an image that gives people a glimpse of this spooky city. It was also fun to return to a style that I developed as part of the original Skull-A-Day project, see HERE and HERE. 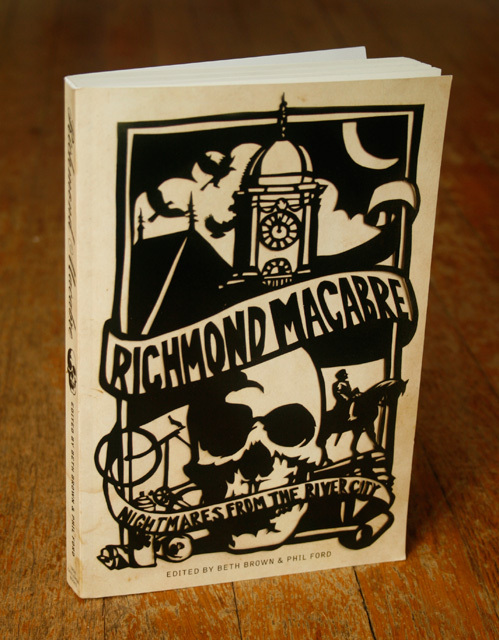 There are also plenty of other upcoming events around Richmond and even if you're not in the area you can still get your own copy of this book online, more details are HERE. p.s. I've been thinking I might try doing a tarot deck in this style next. Interested? 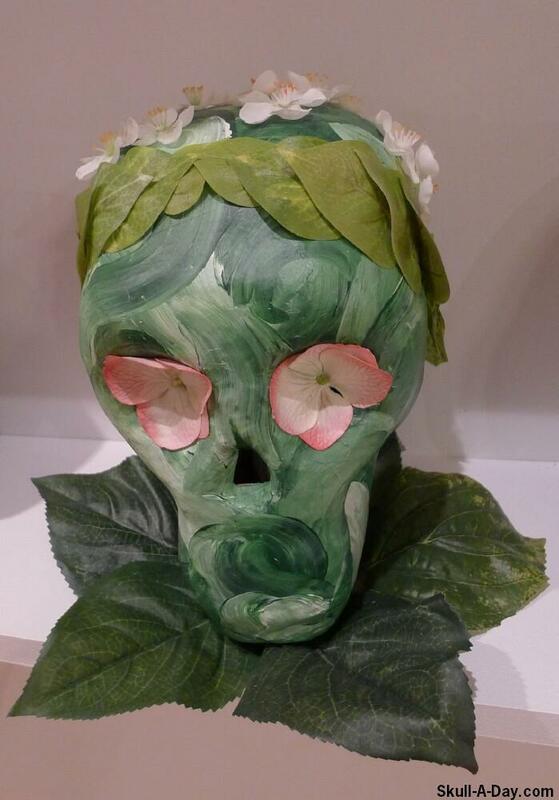 Elizabeth Bambacus "Life in Death"
Long time Skull-A-Day friend, Jay Butler from Richmond, VA made this. He explains, "Fiddling at me desk with these magnetic steel balls called Buckyballs. Slammed 'em down and the attached arrangement arose!" 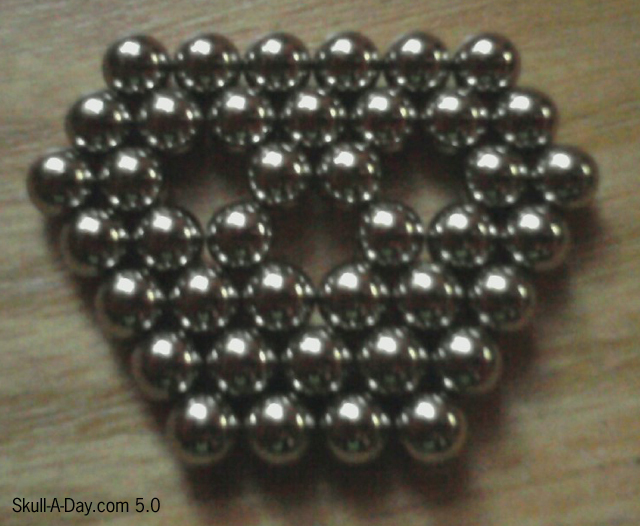 I've always liked these type of magnetic balls since the first time I saw them at the Science Museum of Virginia (here in Richmond). They are lots of fun to play with. I used to fiddle with them at my desk instead of doing my homework...which is sort of like Jay fiddling with them at his desk and not doing work. I could never get them to make a necklace or bracelet...maybe one day. 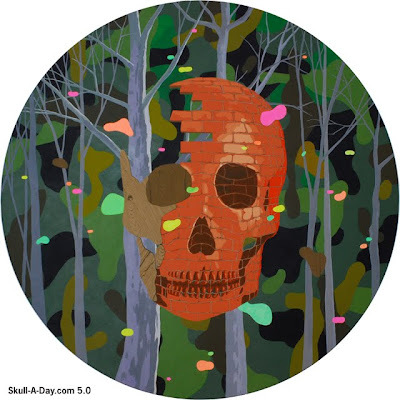 Christian D. Leaf is an illustrator, painter and art director. He is also an occasional comic book inker for Image Comics, but mostly he is a full-time art teacher to his budding artist of a daughter. He has a sketchblog at inkblatt.blogspot.com. 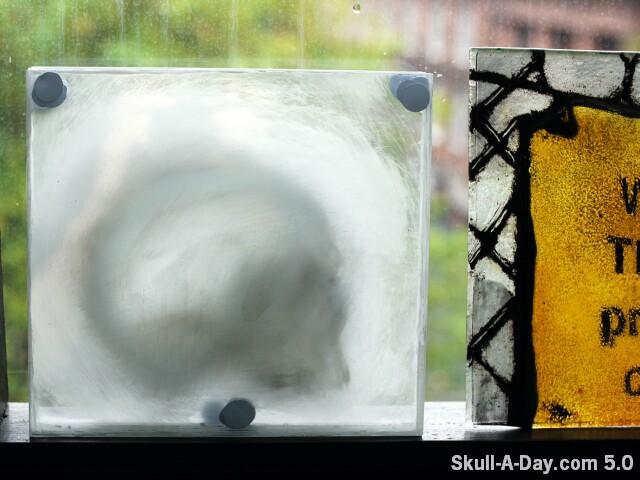 Glass artist Jeff Zimmer from Edinburgh, Scotland shows us an unfinished ghostly skull work that was a sketch he made and then stuck in the window to think about. 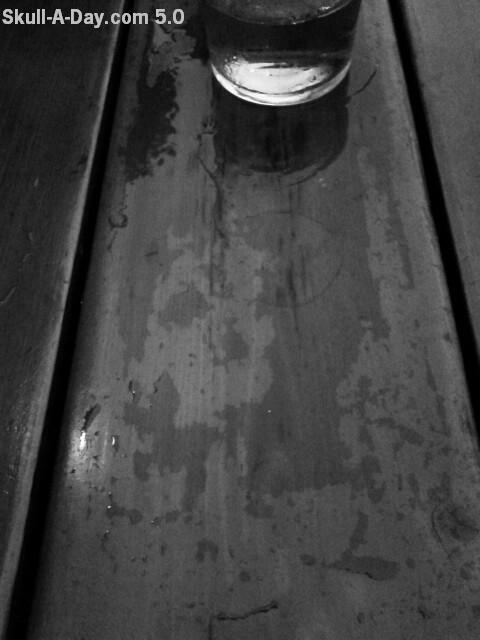 As the ghostlty skull sat upon my windowsill silently watching... waiting... for more? 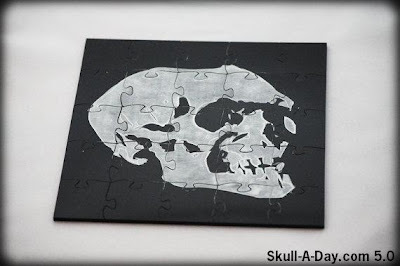 I really like your example of deconstructing the skull down to just a few basic strokes, and still showing that it is easily recognizable.Thank you for sharing your in process ghostly image with us. Sinead Giblin was born and lives in Dublin. Has always been a great lover of art and craft from a very young age and comes from a long line of painters and other creative enthusiasts. 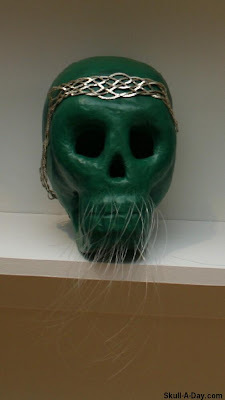 Cormac mac Airt (son of Art) or Cormac Ulfada (long beard), is said to have ruled from Tara, the seat of the High Kings of Ireland, for forty years, and under his rule Tara flourished. He was famous for his wise, true, and generous judgments. The end of the reign of High Kings of Tara came with the conversion to Christianity, there continued to be Kings in Ireland up until the twelfth century but they now ruled with different rules, and the celtic legends were changed to feature saints, including St. Patrick in the story of Tír na nÓg. This mask is totally SICK!!! The details are great and it looks killer when being worn, but I think we're missing the deeper point. 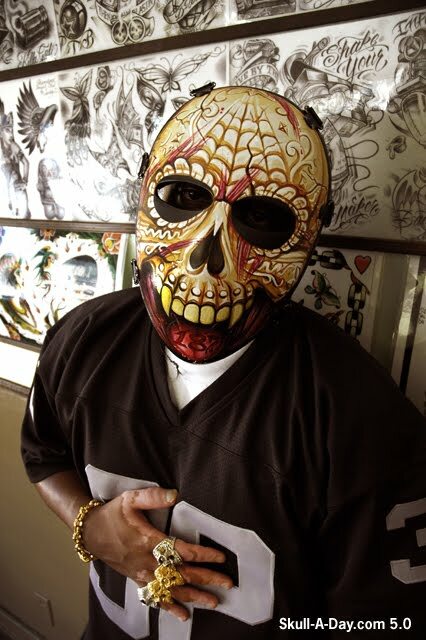 Wearing this mask means that you're telling the world, "MY SKULL IS BULLETPROOF!" Get out, Get up, and Get noticed! The Freehand Profit wishes you would. Thanks, FP! Francisco of "Non Social Photography” submitted these photos he took. 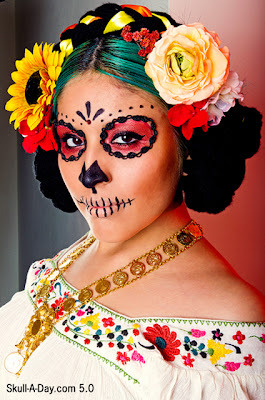 He says, "Perla arrive to my home with a make up for Día de los Muertos or a Candy Skull." 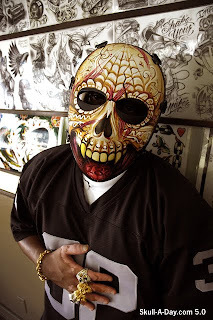 I love skull makeup and costumes. I've worn many of them myself. I like the variation in this particular makeup. The face isn't white like a skull. Instead, it's the model's skin color. The eyes, nose and mouth are still decorated like a traditional sugar skull. 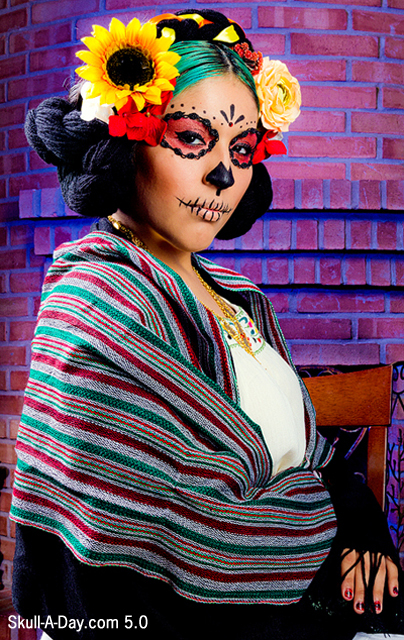 The addition of the outfit and hair adornment help bring out the Mexican heritage of Dia de los Muertos. Francisco sent us many photos from this set. These are my three favorites. Today’s Simulacra are all wet. Finally is one of my own simulacra, I had just come in from the rain and went into my bedroom to get changed. 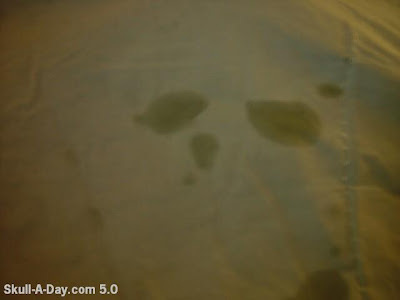 I must have been too close to the bed when I turned on the light because I dripped on the comforter. At least the results were worth it. Thank you both for submitting your excellent finds. Did you know? 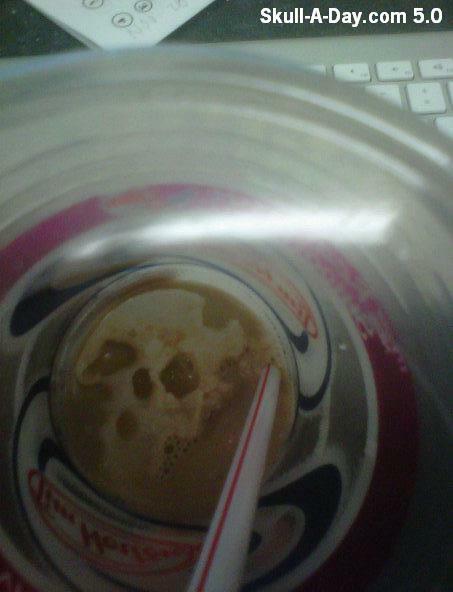 Liquids in its many forms are some of the most popular places in the world in which simulacra are found. 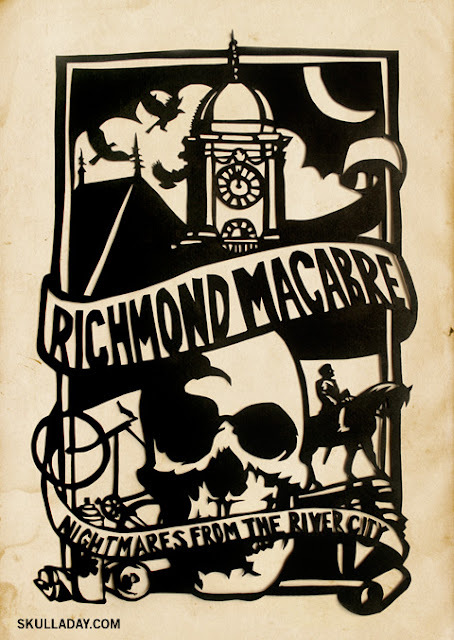 The ever skullacious Wenchkin has done it again with a twist to this traditional logo. She writes, "These are kraft gift bags that were dyed on the outside, white on the inside. 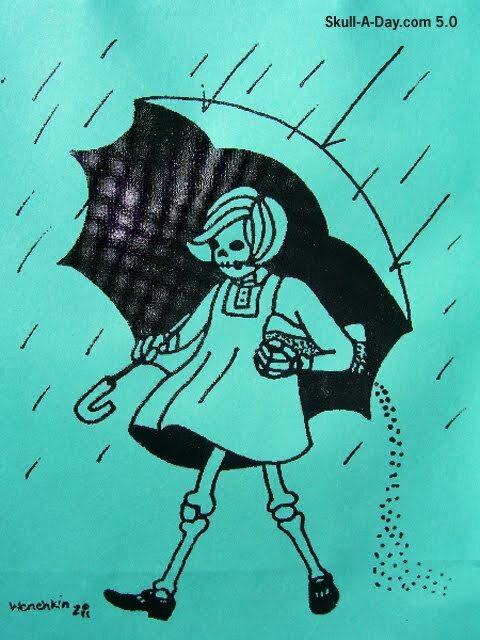 I redrew one of the Morton salt girls as a skeleton and hand silk screened them on to the bags myself." 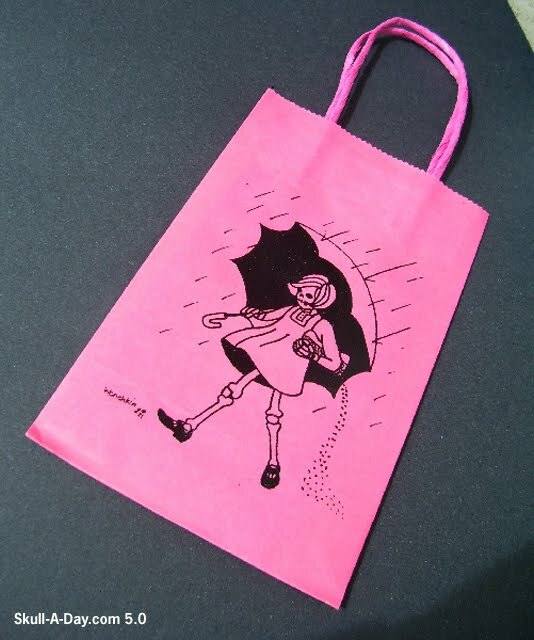 A cute and colorful way to present a gift, carry your purchases, or just a reminder of the ever increasing damages caused by acid rain. Whatever function you let this bag serve you're sure to make a splash with those who see it. 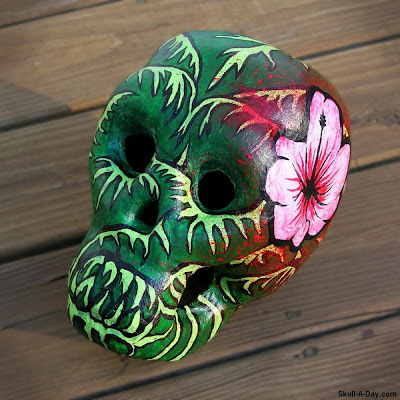 Check out her artfire site to get some of these, or other awesome skull related stuff. Thanks again for the wonderful way to tote in our weekend, Wenchkin! 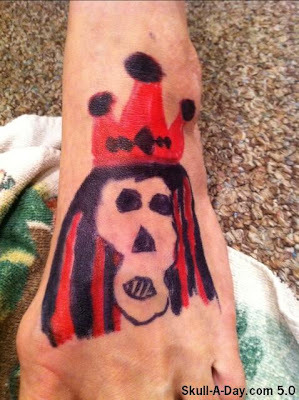 Are you ready for some FOOOOT Skull? All my friends are comin' over tonight! I guess I shouldn't say that too loudly it has been a tough week for you folks in Philly. Thank you for sharing this wonderful piece of art that your daughter did on your living canvas. It always brings us great joy to see art work from the youngest members of our community. Thank you also for being a good sport about it and celebrating as well as nurturing the arts with your whole being. Give our best to everyone at the museum. 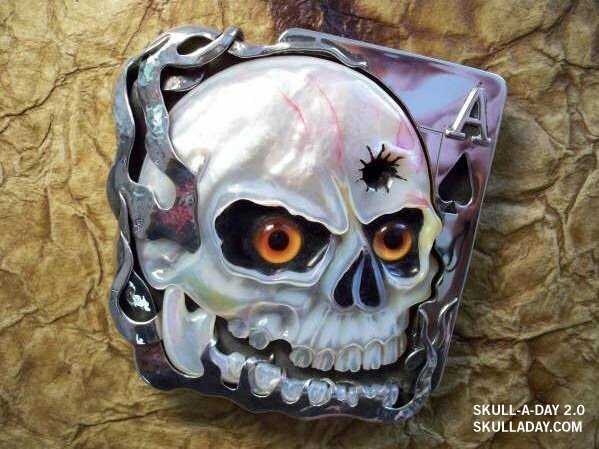 Like most red blooded men I have a strong attraction to crafted metal, especially in the form of belt buckles, and especially when they feature skulls. This beautiful buckle comes from the great John Winston. It's been a while since I've seen it, but it still makes quite the impression. Be sure to click here to see other buckles that have made their wade onto our site as well. Last Sunday, we went to a zombie themed wedding. Yep, zombie themed! Since costumes were encouraged, I decided to do skull makeup. I've done a basic skull and sugar skull makeup before (both with tutorials). I wanted to do something more anatomical, so this is what I chose. 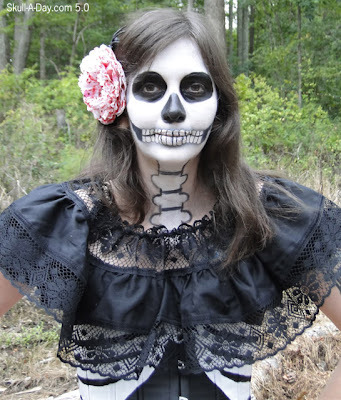 I wrote a tutorial for how to do this same makeup, which is great for Halloween. I painted the ribcage on an existing black satin corset. I made two blood splatter flowers. One for me and one for the bride. 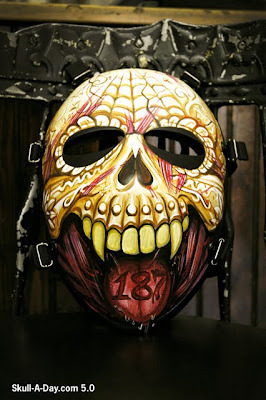 I painted a spinal column on my throat and chest, so it would coordinate with the ribcage corset. Graham Fisher says, "I am a tattoo artist in Blacksburg Va. 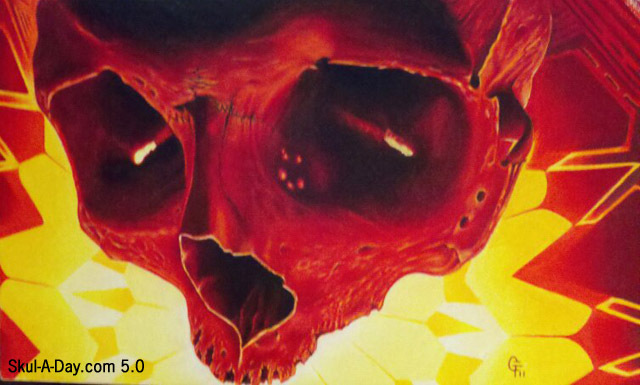 This skull is 11in x 14in, color pencil on illustration board, this one is titled "Alien Red". I like the sharp contrast of the red with the yellow. It makes the facial details of the skull really stand out. The skull shape is a bit alien, but human at the same time. It reminds me of watching "Men in Black" where they state that aliens are all around us. Alien and UFO enthusiast would probably agree with that statement. In our lifetime, we might never know if there is other life in space than us, but with the billions of other galaxies, the possibility is high. Anne Jennings is an architectural historian in NYC. Brained Glass marks her first public attempt at re-entering the art world since abandoning art as a major in 1997. Artist Matthew Borgatti who showed off his laser prowess HERE has returned with a brand new skull puzzle to entertain us with. 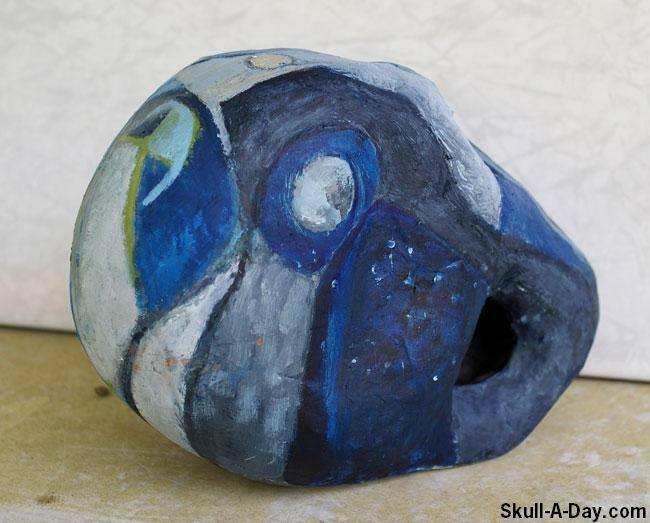 Thank you again for sharing another amazing creation with us and continuing to participate with the Skull-A-Day community of artists. Heather Addley is a photographer and is currently working on a 365 project entitled 365 Days of Me. 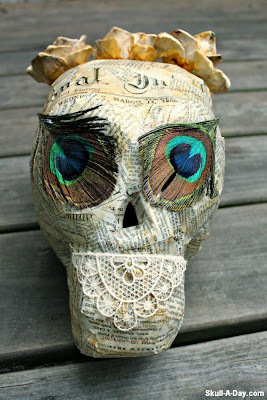 She posted more images of her finished skull HERE. This painting comes to us from James Kudo without any type of description. I know that some things are best left unsaid so maybe I'll let my self focus on listening to the Earth, Mother of the materials included in this painting. Well, I tried, and all I could think of was, "if a brick skull fell in the woods would it be the big, bad wolf's fault?" I don't know, but the natural colors of this skull are warm and inviting, like a natural Earth friendly home, surrounded by the peace and quiet of the forest. Thanks for inviting us in, James! 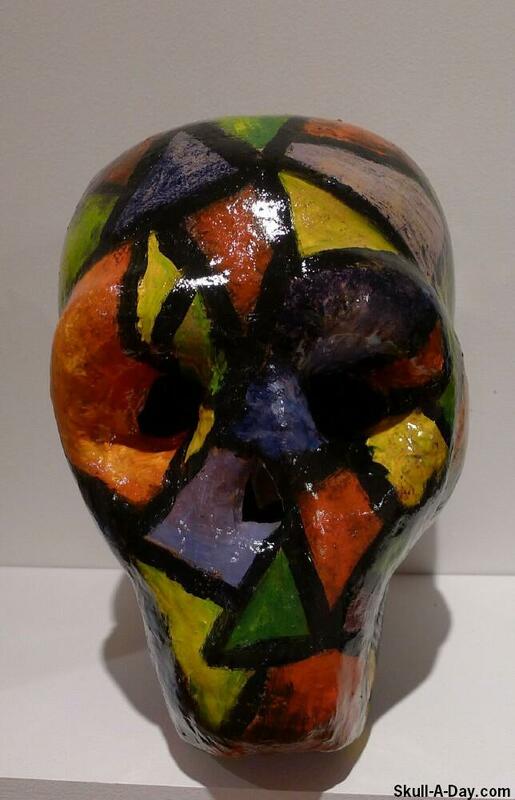 Rachel Martin of Baldock, Herts, UK submitted this piece. 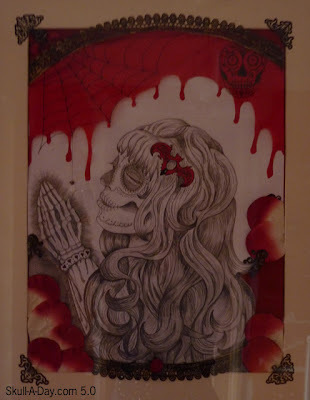 She explains, "It is a portrait of my elder sister, a London Rollergirl named 'Spooky Von Strange' drawn in a Mexican Sugar Skull style. I used pencil, tissue paper, paper rose petals, vintage doilies, transfers and bits of old jewelry. I am really happy with the finished piece and gave the original to my sister for her birthday." 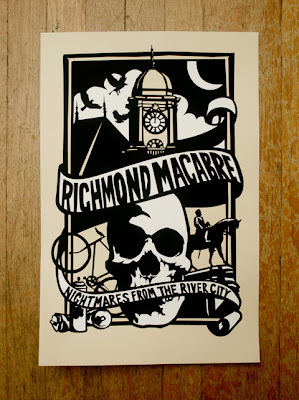 I like these sort of morbid portraits of the living. They remind me of mortuary photos, but are more artistic. The use of layers in this piece is a nice variation that make the piece more personalized. It's a beautiful piece. Rachel's sister is a lucky gal. 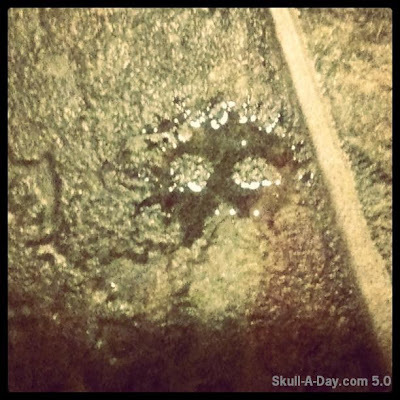 Today’s simulacra were all found in the shower. Tyrone in Kunkletown, PA told us he found this fellow hiding on the bathroom wall. “Bearded Jon” said: “I got out of the shower the other morning and was stared down by this splashy little guy. Thank you all for sharing with us some wonderful new simulacra to add to the ever growing collection. 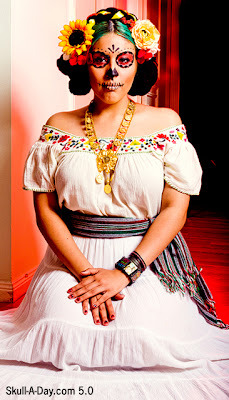 New York City based Daniella Garcia is a jewelry design artist who happens to like the same things we do...SKULLS! 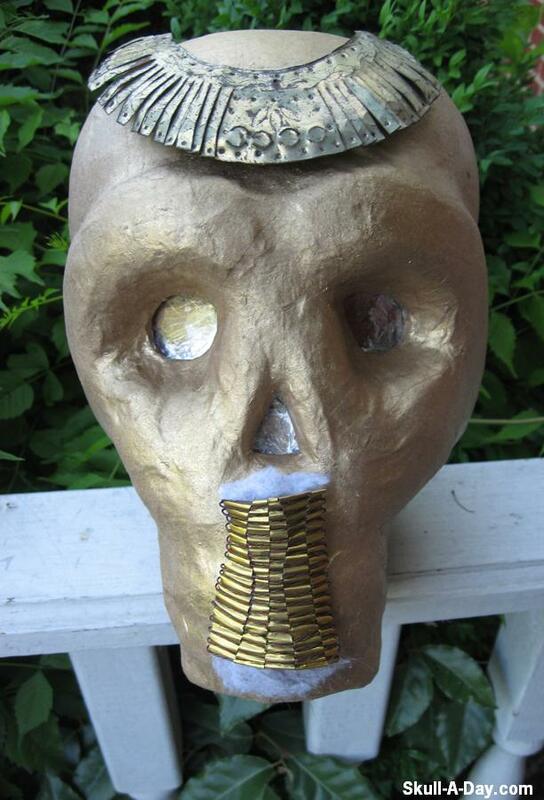 Her submission is a "very real looking primitive skull charm that was hand carved from bone and was cast." 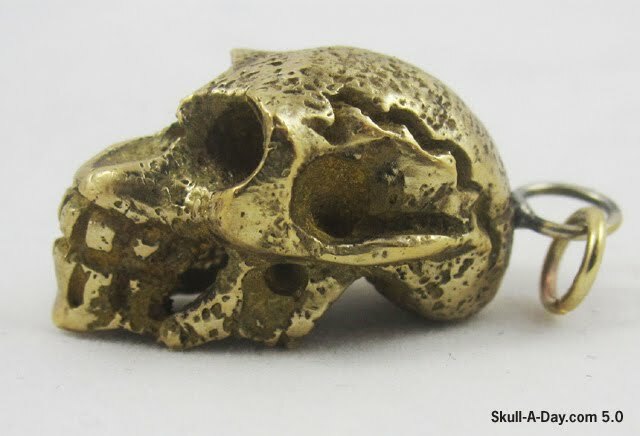 Her site (that has tons of skulls) will let you know that this piece is also available with a high polish, but I like the antiqued look that was done to this one. The rough texture really adds to the aged look that primitive jewelry would have. An ancient artifact cast in time to connect the past to today. Thanks for the submission, Daniella! 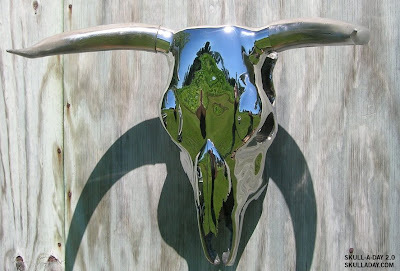 This amazing piece of steel sculpting is from long time Skull-A-Day friend Larry Pearson. Larry has perfected his methods of metal work with numerous sculptures that are all wonders of welding. He's been featured on Skull-A-Day before with his Skull Daisy, Santa Skull, he was the creator of the Major Skull Award awarded to Eric Vanderkooi for our United Flags Of Skull-A-Day contest(which is a flashback of it's own), and was even included in Braincase XXII with his Hand Of Fate. Larry has tons or great metal works on his site, and it may be literally tons considering the weight and material of the pieces he creates. 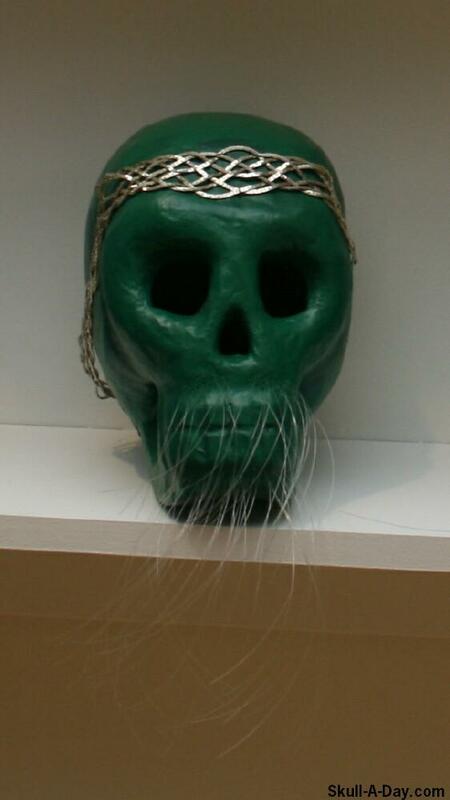 Thanks to you, Larry, for all of your great submissions and for helping make Skull-A-Day was it has become. “I have no idea how or how long ago I found your blog, but I've been visiting daily ever since. I really like the ‘found’ skulls people share that may have otherwise been overlooked in our daily lives. I am sorta on a dark streak lately and have been obsessing over skulls. I now have a few to share with you. I decided I wanted to make a polymer clay, skull cane. It's tricky because you don't really know how it's going to turn out until the end. I just let lose and tried to have fun with the results. The results of the unknown turned out awesome. I love your story about leaving these beads around for others to find. May you also have luck in finding some found skulls in your everyday life. Thank you for being a loyal reader and also for contributing to cause. This drawing happened because I wanted to draw something that mixed my old and new styles of drawing. I started drawing figures like this back in college, when I wanted to expand my use of body proportions for something other than fashion design figures. 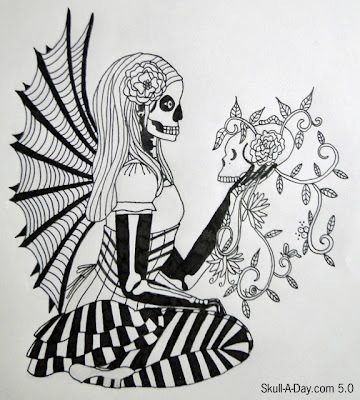 I used to draw a lot of fairies, so I wanted to use that concept, but add a Dia de los Muertos inspiration to it. I drew it in pencil first and then painstakingly inked it in. I plan on drawing more figures and adding water color paints to them. For this one, I like the black and white the way it is.